Diamonds are every ones best friend. Some of the best known diamonds in the world are here. Diamonds:tm is a fast paced strategy game. The first player to collect 25 diamonds WINS. Diamonds is played by 2 people. Ages to play Diamonds is 12 to Adult. Playtime for Diamonds is about 30 minutes. Diamonds contains 12 flat, round tokens of 2 different color groups. Six (6) tokens are blue and 6 tokens are red. labeled with numbers exactly the same as the blue tokens. This board game is played with 48 diamonds. 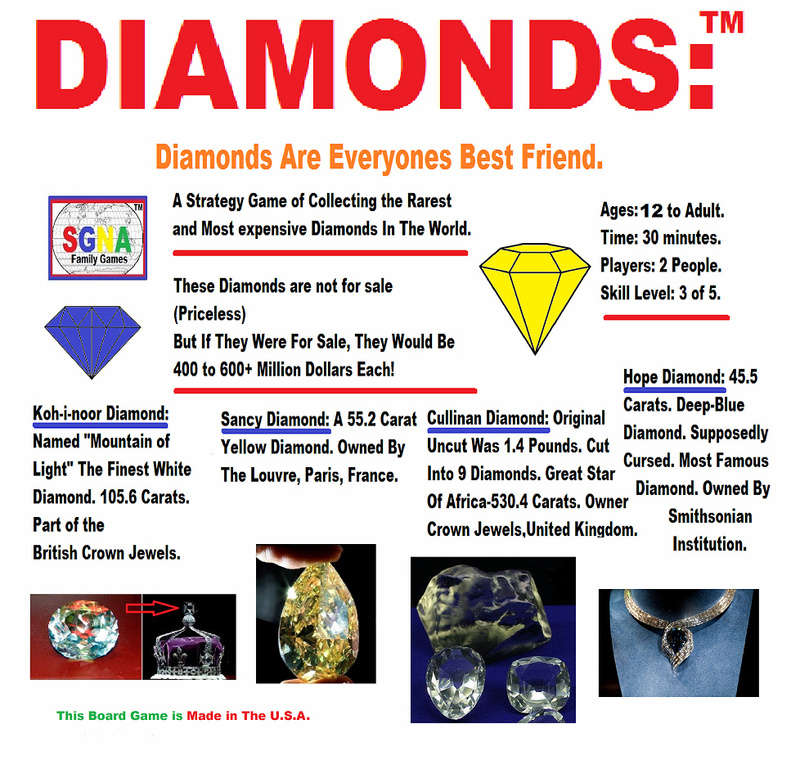 The diamonds are represented by stylized diamond tokens. each symbol, encase of loss or application error. KING. The 3rd side labeled with a QUEEN. The 4th side labeled with a HORSE. The 5th side labeled with a BISHOP, and the 6th side labeled or engraved with a CASTLE. PAWN..A pawn may move one square at a time, forwards or backwards, diagonally to collect a diamond or to capture a token of the other player or to make a strategy move. KING..A king may move one square at a time horizontally or vertically or diagonally to collect a diamond or to capture a token of the other player or to make a strategy move. make a strategy move; as long as it is a straight run without any diamonds or tokens between the start and the finish of the move. to make a strategy move; as long as it is a straight run without any diamonds or tokens between the start and the finish of the move. BISHOP..A bishop may move forward or backwards and may move diagonally up to the length or width of the playing board to collect a diamond or to capture a token of the other player or to make a strategy move; as long as it is a straight run without any diamonds or tokens between the start and the finish of the move. HORSE.. A horse may move in any "L" shape on the playing board. A horse may move one square up and two squares to the right or the left or a horse may move two squares up and one square to the right or the left and they may move in any direction on the board. A horse may jump over other tokens and diamonds during a move, in order to land on an empty square or to capture one of the other players tokens or to collect a Diamond. turn. It is then his opponents turn to roll the dice for a move. The objective reason for capturing an opponents token is; the more tokens a player has and the less tokens a players opponent has then the more chance a player has at collecting the most diamonds. When a player lands one of his tokens on a square that is occupied by a diamond, the diamond is removed from the playing board and collected by the player. His token remains on the square. Place the 6 white tokens on the 6 Red squares at one end of the board, one token per square, in any numerical order. Place the 6 other tokens at the other end of the board on the 6 Red squares, in any numerical order. Place the 48 diamonds on the green squares, one diamond per square. The game is now ready to begin. First place the playing board on a table; the players sit at each end of the board. Each player selects a set of 6 colored tokens, then set the board up to start the game. The first player rolls both dice. This roll indicates to the first player what token he can move and what type of move the token can make for him to collect a diamond. It is then the second players roll and move. 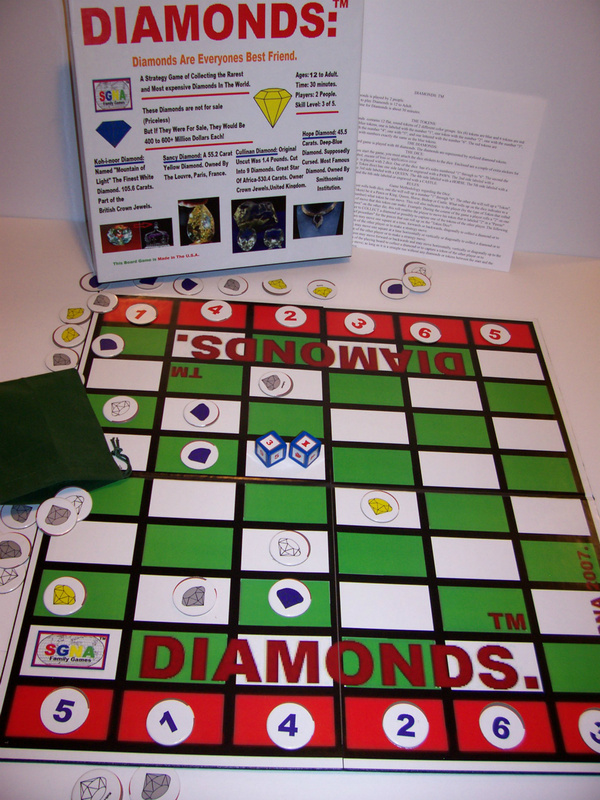 The object of the game is for each player to collect diamonds and capture up to 5 of the opponents tokens. The first player to collect 25 diamonds WINS the game. If both players collect 24 diamonds, it is a tie game.